Foam sealant is used to seal and fill holes and cracks throughout your home, garage or other structure. It is waterproof, airtight and can be painted or stained if needed. Foam sealant is a good choice for sealing cracks to keep rodents out of your home. The wet foam sealant expands and hardens quickly on most surfaces, including carpet, clothing and wood. Cured foam sealant is durable, so removing it can be difficult--but not impossible. 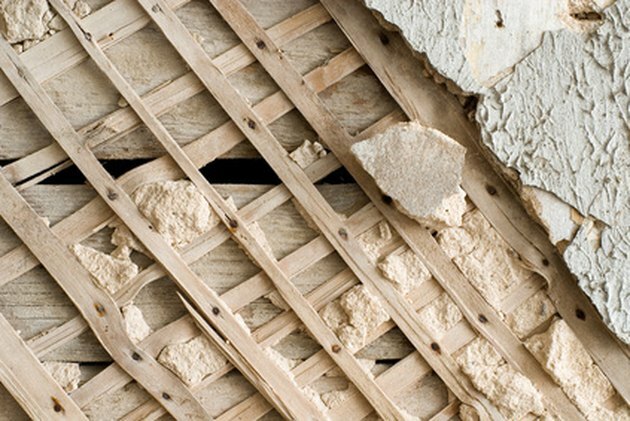 Foam sealant fills cracks and holes in homes and other structures. Wipe moist foam with a cloth saturated in acetone nail polish remover. Rub petroleum jelly on the foam dried to hands or fingers. Place your hands in a plastic glove and wear for one hour. Rinse the petroleum jelly and foam off your hands with warm, soapy water. Wipe moist foam sealant from the fabric or other surfaces with a dry cloth saturated with acetone nail polish remover. Scrape dried foam sealant from the surface with a putty knife or sand the foam down with fine-grit sandpaper. Apply a foam sealant remover directly to the dried foam sealant. Allow the foam sealant remover to sit on the foam for five minutes. Rub the foam with a plastic scrubber or old toothbrush. Wipe the remover from the item with paper towels. Repeat the process until the dried foam sealant is removed from the surface.